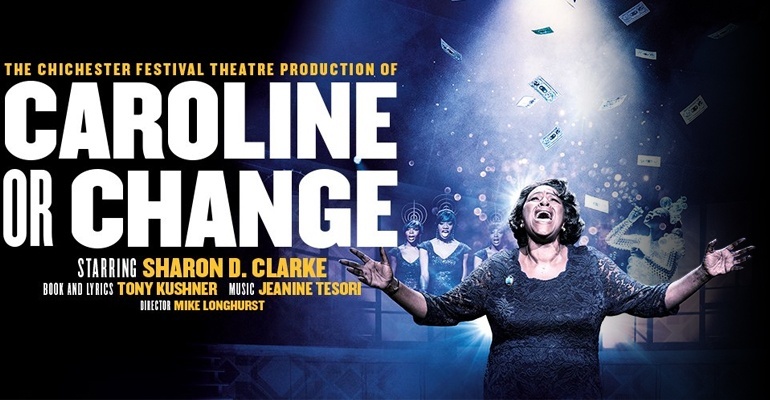 "A show that feels truly original"
"A riveting fusion of social upheaval and hummable songs"
After sold-out seasons at the Hampstead Theatre and Chichester Festival Theatre, Michael Longhurst’s production of Olivier Award-winning musical Caroline, or Change transfers to the West End. Playing a limited season at London’s Playhouse Theatre, the five-star show takes place in America at a time of significant social upheaval. Following poorly paid maid Caroline Thibodeaux, the story sees her surrounded by a life of work in a sweltering basement. But when more money is placed in her pocket than normal, the winds of change are put to test. Featuring a book and lyrics by Tony Kushner (Angels in America) and music by Jeanine Tesori, the production is set against a soaring score that features blues, soul, classical and traditional Jewish music. Award-winning actress and theatre legend Sharon D. Clark reprises her role as Caroline, after receiving critical acclaim in the show’s previous runs. Caroline, or Change runs at the Playhouse Theatre from 20 November 2018 to 9 February 2019. Astonishing that a couple of reviewers here could not comprehend what is an eminently lucid narrative arc! A plotless non story with discordant, dreary songs and incoherent lyrics. At times, I questioned if I was hallucinating cause the staging was so out of keeping with what I thought the show was about. Such a shame as the main actress had such a fantastic voice and deserves a better vehicle to showcase her talents. Left at the interval, and lasted longer than couple in front, but maybe stayed too long. Sadly won't be recommending. Absolutely brilliant. Fantastic singing, great set pieces, just lovely. Been twice and will be going again. Unbelievably mind numbingly pretentious rubbish!! The cast are fantastic (amazing voices) but the story is truly awful!! Loved the show. Amazing voices. Maybe a little unusual in the staging and presentation of the storyline. Avoid dress circle F2. Not sold as restricted view but could only see 60% of the stage. Shame the theatre doesn't recognise this. Very poor. Im not sure why this has won awards. The one good thing (and there is only one good thing) is the incredible voice of the leading actress. It was so bad I thought it was about depression. The next day I had to read about the show on the internet to find out that it is about the "evils " of money …. whatever !! Such an amazing creation: Kushner's usual playfulness and profundity, plus fabulous music. The ensemble are a joy, and Sharon D. Clarke is stunning, stunning, stunning. Standing ovation at our performance. The cast translated the emotion of the characters perfectly. Outstanding performance! Spent 35 minutes on the phone to ATG to purchase one ticket and get one free as advertised as my name is Caroline to be told it’s only valid Monday - Thursday. Might want to advertise this fact to stop people wasting time phoning to try and book Friday or Saturdays, would have saved me wasting my time. Saw this thought provoking show tonight.Upper circle stairs are a kiler and the seats have no leg room . Your knees are touching the back of the person in front of you.For £22.50, seats could be better.I am home now and my knees are so sore. Otherwise the show was great . I felt sorry for the tall people whose knees were also squashed. Rating 4.0 because of poor seating and killer stairs. My friend and I had a great time at our first visit to your theatre last night. I would like to thank the lovely manager to managed my (apparently very calm) panic attack (upper circle stairs too much at the height) and reseated us, without any fuss at all. Brilliant. I would warn you though, the stairs are a killer and the bar has minimal seating when you get there. I would be great if on early arrival ushers would advise and offer the option of staying downstairs until close to the seat being available. Aside from that it was a beautiful night and seats are so comfortable.